For people with Nature access: read all about it. For people without: read what the New York Times has to say all about it. Another helpful preadaptation [what an awful word choice -Ed.] is a snippet of DNA that enhances the activity of the genes that drive the formation of limbs in the embryo. The Amemiya team focused on the enhancer DNA sequence because it occurred in the coelacanth and animals but not in ordinary fish. They then inserted the coelacanth enhancer DNA into mice. “It lit up right away and made an almost normal limb,” said Neil Shubin, meaning that the coelacanth gene enhancer successfully encouraged the mouse genes to make a limb. Dr. Shubin, a member of the team, is a paleontologist at the University of Chicago. 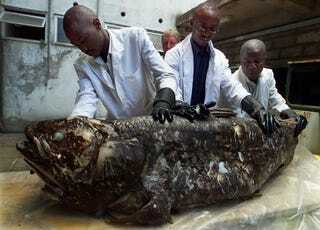 Image from Getty Images, used by NYT in their article, makes a very dead coelacanth look delicious.